So it’s beginning to look like a forest down there and you’ve got your favorite waxing technician on speed dial. Good call! But before you schedule your regular run-of-the-mill Brazilian wax, here’s the #1 question you need to ask her. “DO YOU SUGAR?” Here’s why. Sugaring Paste is 100% Natural! - Sugaring pastes are created from a mixture of organic ingredients such as sugar, water, and lemon juice. Without the added chemicals, it causes less irritation and leaves your skin feeling soft and refreshed, making it perfect for any skin type. Say goodbye to ingrown hairs. - It’s all about the technique baby! Since the hair is removed in the same direction as hair growth, there’s less chance of hair breakage at the follicle and you can also kiss that awkward looking stubble goodbye. Take a few weeks off. You deserve it! - If this is your first time getting sugaring treatments, your first three sessions will be a few weeks apart as your hair begins to thin. Once your hair gets used to the regular flow of treatments, results can last up to 6 weeks and in a lot of cases, lead to permanent hair removal. Say “Bye, Felicia!” to painful waxing. 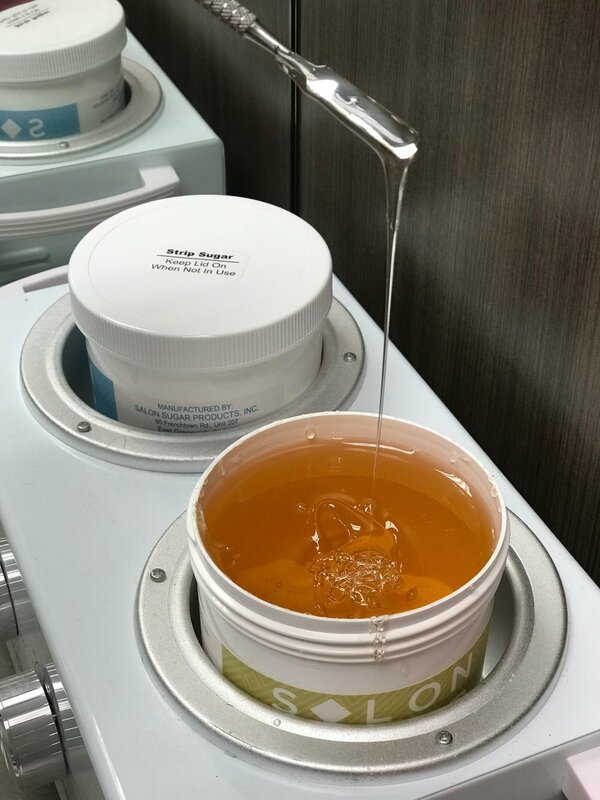 - While we all have varying thresholds for pain, many sugaring clients have shared that compared to waxing, it’s a lot less less painful. It’s perfect for germaphobes. - And that means, no double dipping! You’ll receive your very own sugar ball freshly made as opposed to being treated from a tin of wax that may have been used to service 10 other clients that day. Just add water and you’re done! - The sugaring paste can be easily removed from the skin with soap and water. So say goodbye to icky residue.